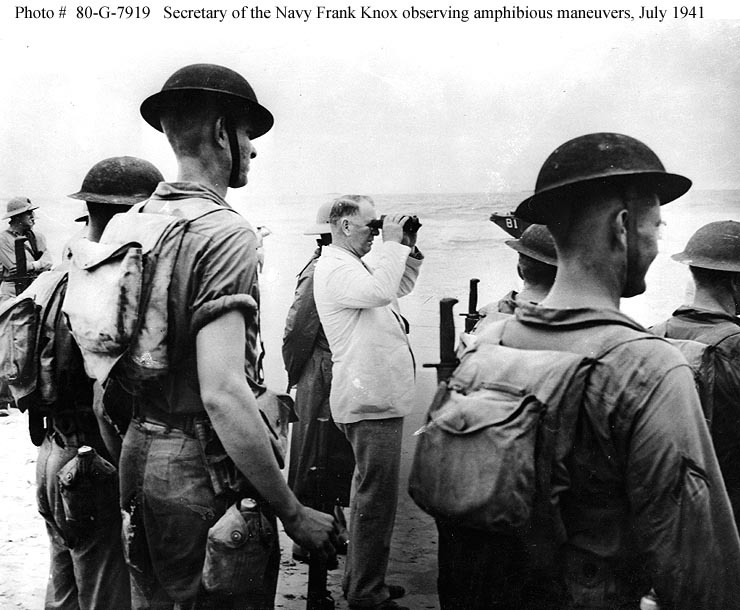 US People--Knox, Frank, Secretary of the Navy, 1940-1944. 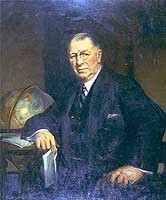 William Franklin Knox was born in Boston, Massachusetts, on 1 January 1874. He attended Alma College, in Michigan, and served in Cuba with the First Volunteer Cavalry (the "Rough Riders") during the Spanish-American War. Following that conflict, Knox became a newspaper reporter in Grand Rapids, Michigan, the beginning of a career that grew to include the ownership of several papers. He changed his first name to Frank in about 1900. 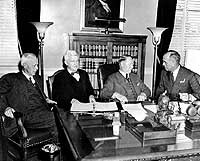 During World War I, Knox was an advocate of preparedness and United States participation. He served as an artillery officer in France after America entered the hostilities. 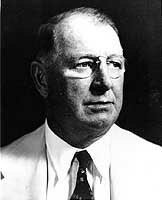 In 1930, Frank Knox became publisher and part owner of the Chicago "Daily News". 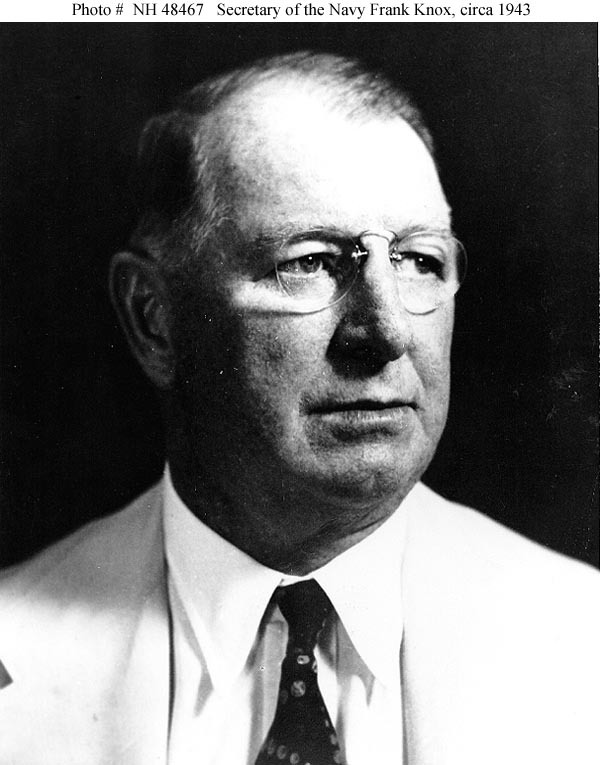 An active Republican, he was that party's nominee for Vice President in the 1936 election. 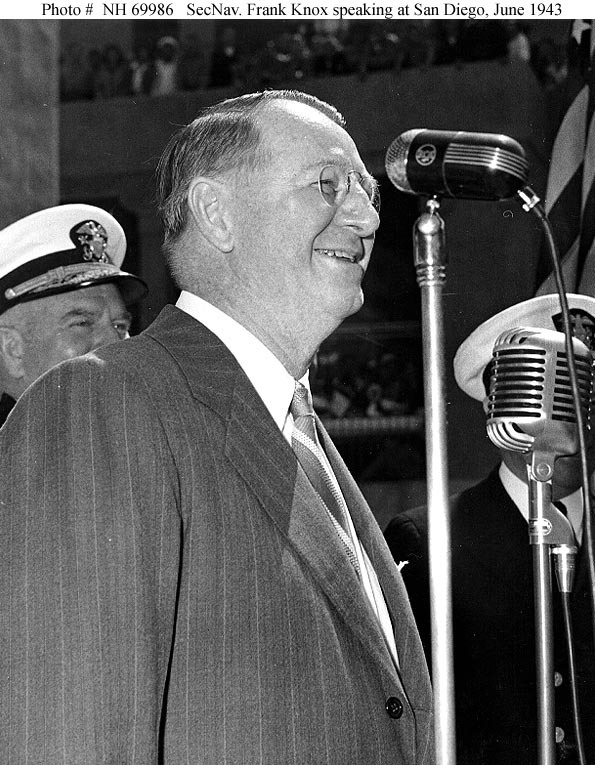 Knox, who was an internationalist and supporter of the World War II Allies, became Secretary of the Navy in July 1940, as President Roosevelt strived to create bi-partisan appeal for his foreign and defense policies following the defeat of France. 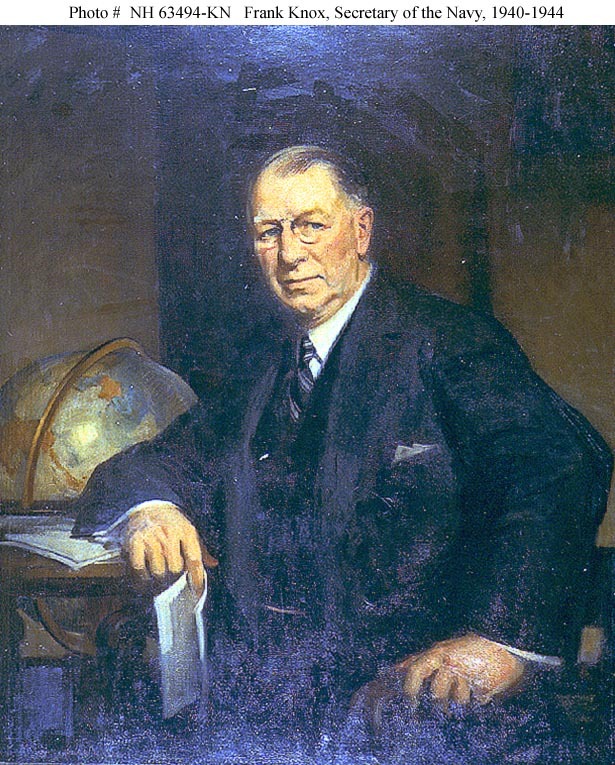 As Secretary, Frank Knox worked hard to expand the Navy into a force capable of fighting in both the Atlantic and Pacific. 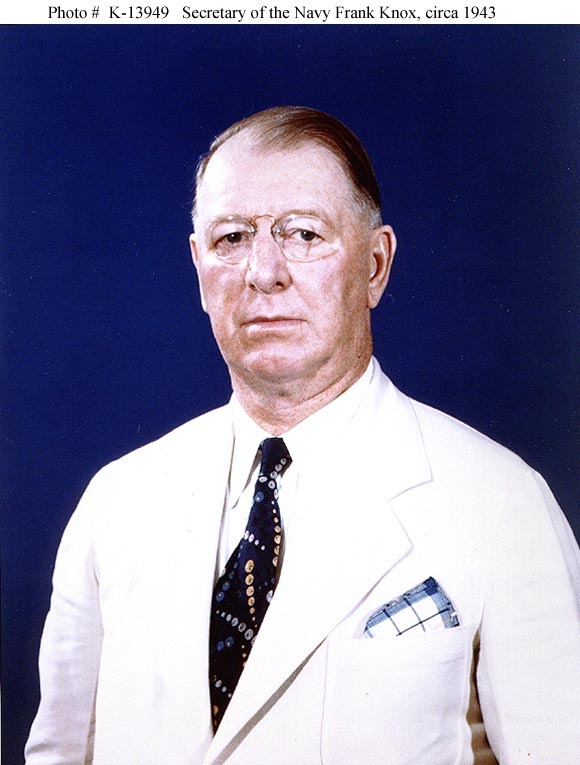 His selection of new uniformed leadership in the wake of the Pearl Harbor disaster was important to seeing the Navy through the difficult, losing months of 1942 and the intense fighting that marked the U.S. offensives that followed. Though he tended to leave military matters to the officer corps, his administrative talents and good judgement made invaluable contributions to the victory that he would not live to see. 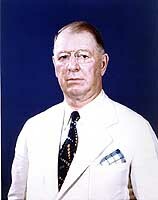 On 28 April 1944, following a brief series of heart attacks, Secretary Knox died in Washington, D.C.
USS Frank Knox (DD-742, later DDR-742) was named in honor of Frank Knox. This page features selected views of Frank Knox. 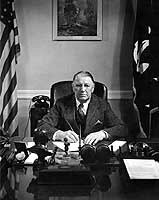 At his desk in the Navy Department, Washington, D.C., circa 1943. Portrait photograph by Maurice Constant, 1943. Collection of Fleet Admiral William D. Leahy. Standing with a group of U.S. Marines, while observing joint maneuvers at New River Inlet, North Carolina, circa 17 July 1941. Note combat gear worn by the Marines and bow of beached landing craft in the right center background. 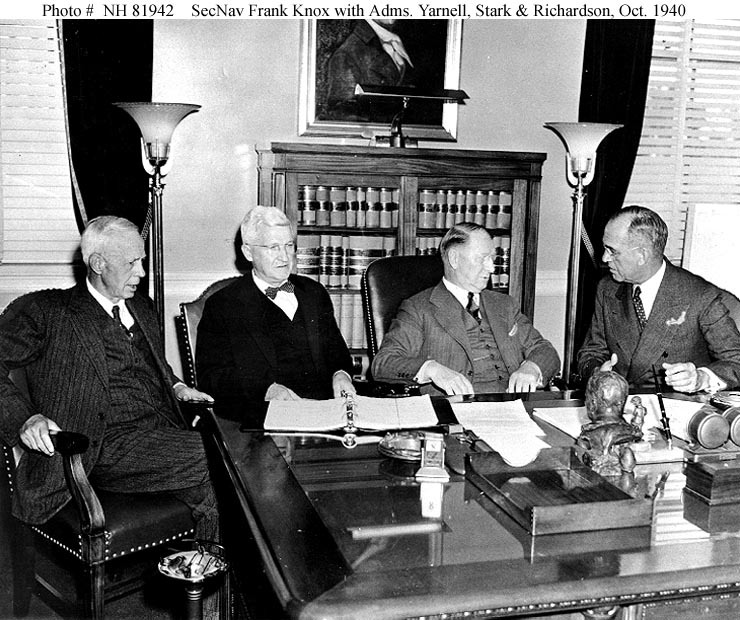 Confers with Admiral James O. Richardson (right), Commander in Chief, U.S. Fleet, in the Secretary's Office, Washington, D.C., on 10 October 1940. 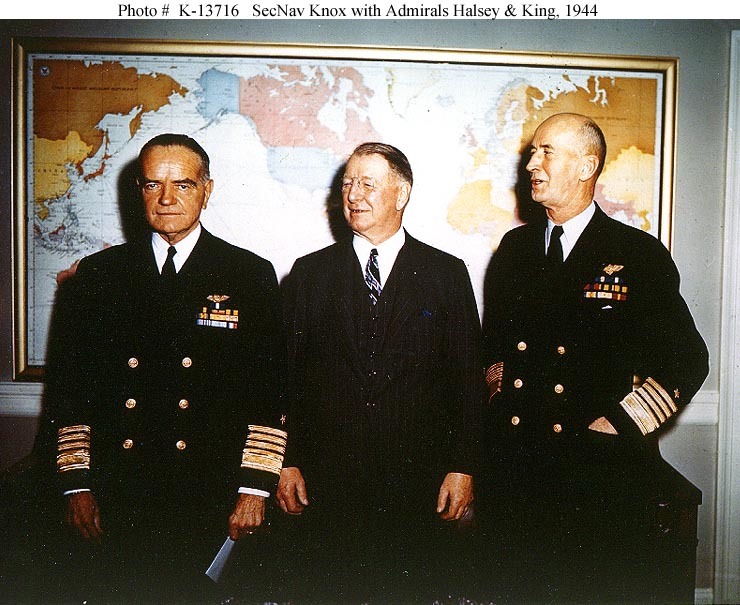 Also present are Admiral Harry E. Yarnell, USN(Retired) (left) and Admiral Harold R. Stark, Chief of Naval Operations. 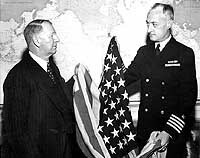 Admiral Richardson was in Washington to protest the continued basing of the U.S. Fleet at Pearl Harbor. Collection of Admiral Harold R. Stark. Tells patients at the U.S. 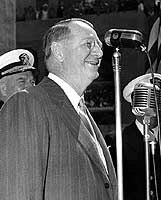 Naval Hospital, San Diego, California, to "get a laugh out of life", as he addressed them informally during a visit in June 1943. 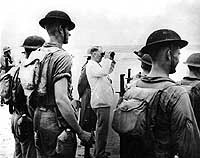 The Secretary gave special praise to the men in the audience who had fought on Guadalcanal. 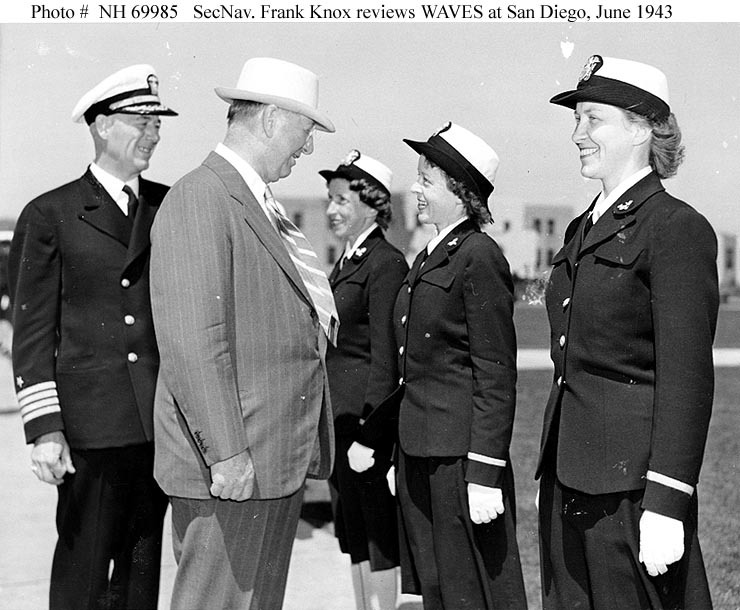 Reviews WAVES officers during a visit to the Naval Training Station, San Diego, California, in June 1943. He is seen here chatting informally with Ensign Margaret Campbell. Ensign Bertha Shoves is at right, and Ensign Mary Cave is in the photograph's center. The Training Station's Commanding Officer, Captain Henry C. Gearing, USN, is at left. 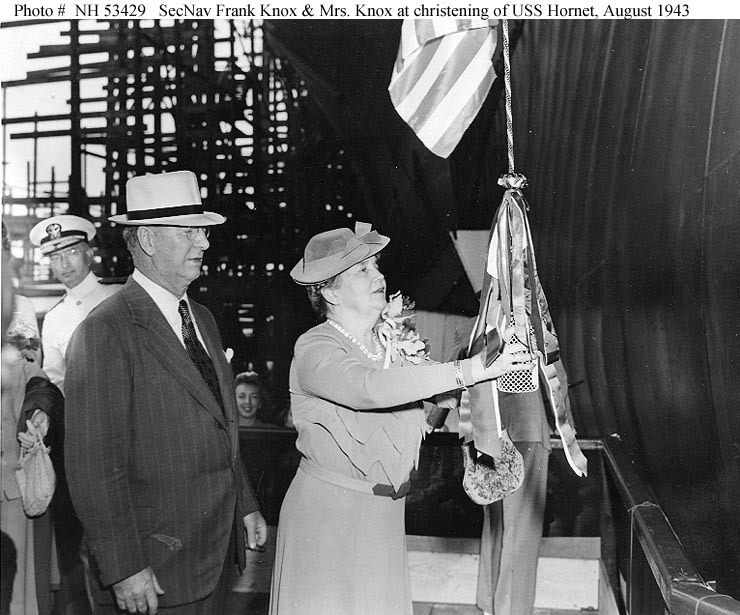 Secretary of the Navy Frank Knox and Mrs. Annie Reid Knox, the ship's sponsor, at Hornet's christening ceremonies, 30 August 1943. 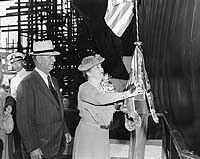 The carrier was built at the Newport News Shipbuilding and Dry Dock Company shipyard, Newport News, Virginia. 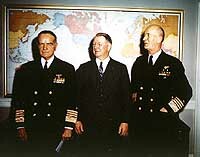 With Secretary of the Navy Frank Knox (center) and Admiral Ernest J. 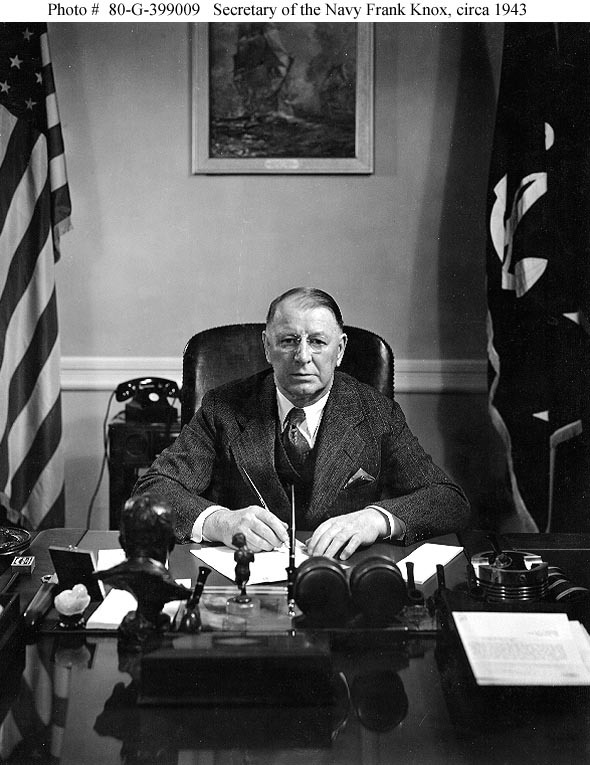 King at the Navy Department, Washington, D.C., in January 1944. He had just been presented with a gold star in lieu of a second Distinguished Service Medal. Receives the first United States' colors to fly over Japanese territory that had been captured by U.S. forces, at the Navy Department, 29 February 1944. This flag had been raised over Kwajalein on 31 January 1944, during ceremonies on the first day of landings there. 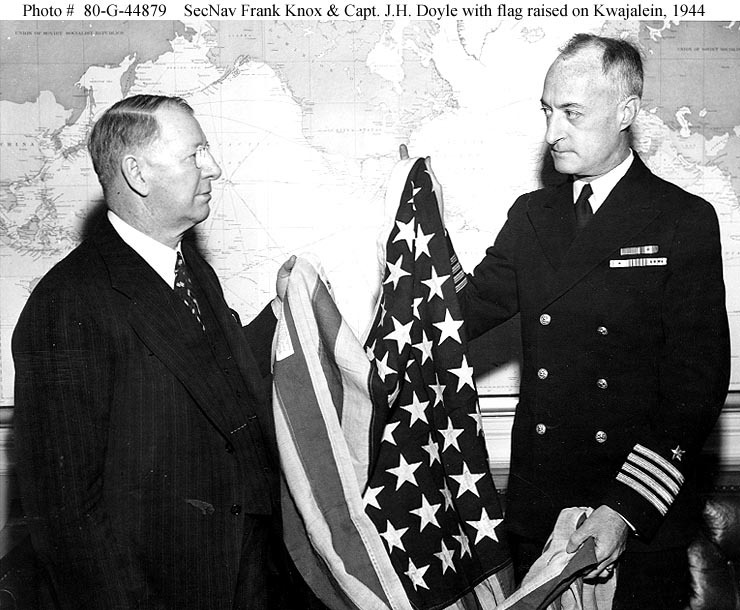 Presenting the flag is Captain James H. Doyle, USN.